Dionysios is the “saint” if the Greek island of Zakynthos. Once a year the islanders take the corpse out of the local Church. 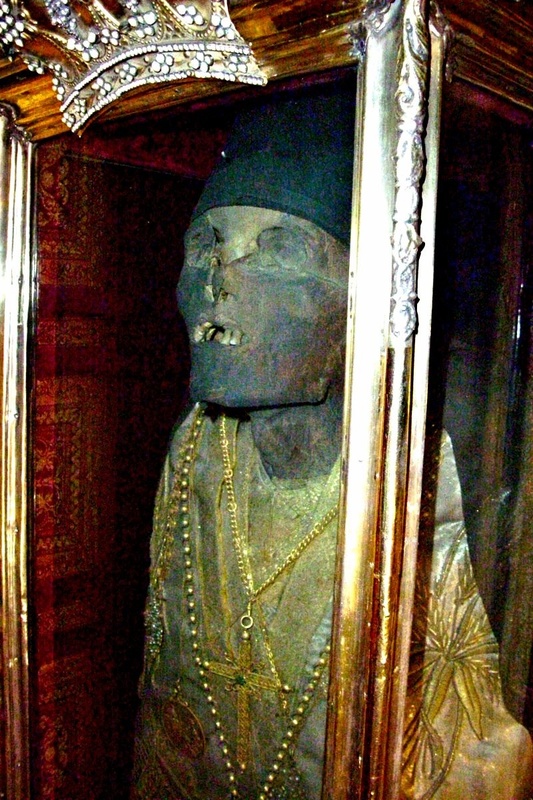 The corpse of a Greek “Saint” is standing i a box inside the Church. 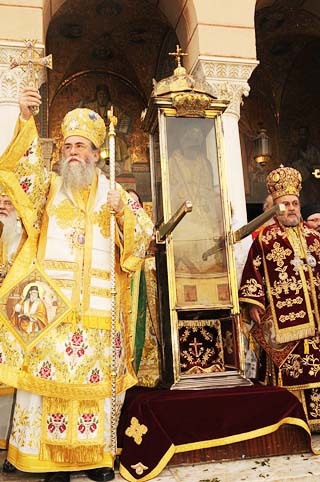 Saint Dionysios of Zakynthos was a 16th-century Orthodox Christian Archbishop of Aegina. He was born on the Greek island of Zakynthos in 1546. He is the patron saint of Zakynthos (sometimes called Zante in English) and is celebrated on August 24 and December 17. 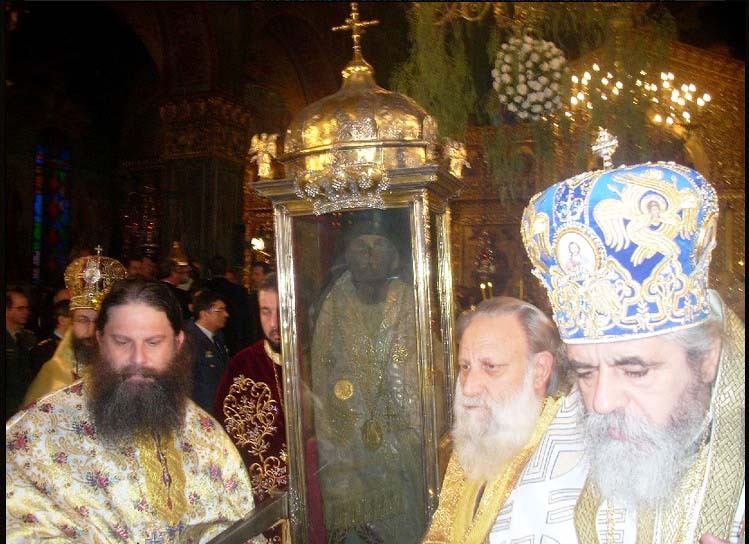 The coprse of Dionysius of Zakynthos is not a pretty sight. In his early life, Dionysios joined a monastery a few miles off the coast of Zakynthos. After a while living there, he was encouraged by his fellow monks to be ordained as a priest, which he did. He eventually decided to travel to the Holy Land by way of Athens. If you do not read your Bible, you will not know that Jesus speaks about the walking dead. Human beings who apparently are breathing, but are spiritually dead. 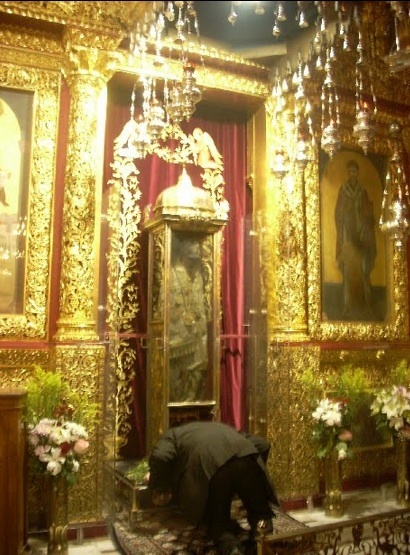 The Greek Orthodox keep their “holy corpses” inside their religious shrines. 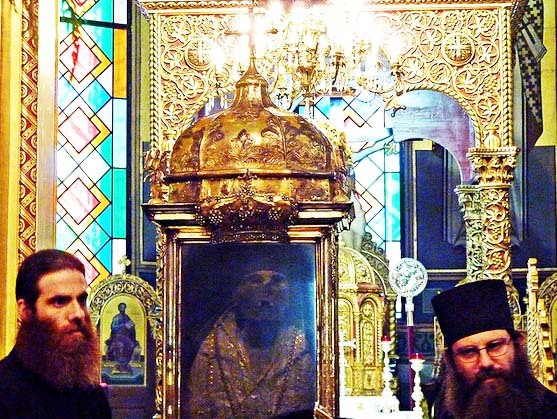 The Orthodox priests carry their “holy saint” out of the Church. The religious people bow down and kiss the feet of the corpse. 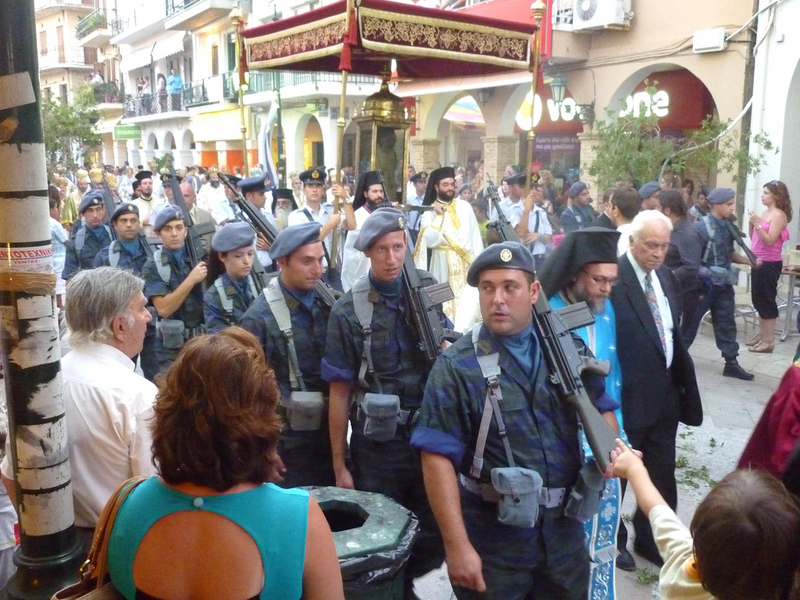 And once a year, they take their “holy corpse” out for a parade, with a military guard of honor. Jesus the Messiah told his disciples to avoid such persons. Such dead individuals could go and bury their own dead. These Orthodox religious people do not understand these scriptures, nor do they listen to the Holy Spirit. Not at all letting the deceased people remain in their graves, they exhume skulls, bones and corpses. Next they parade this kind of rotten human remains through their streets. Even honoring decapitated items of flesh, with military guards. How pathetic it is, that claimed to be Christian priests and bishops promote such events to be pleasing to God of the Bible. We can only pray for these souls, that they eventually will open their Bibles. When they read, their deeds will be exposed as wicked and evil. May Jesus the Messiah have mercy on these deceived souls. Amen. What is pathetic is that you have no respect. Read a history book and you will see that Jesus Christ founded only one Church. We can learn so much by the example of the Saints and they lead us closer to Christ. I have kissed this saint”s feet every year for the last 28 years during my visits to Zakynthos. The amount of holiness that you feel from his body is incredible. His face is a dear and beloved face for me, and he is loved and revered by the people of the Island and from elsewhere. The list of miracles worked by him is very extensive. My own hands were healed in his church. This is a very powerful saint. God bless his holy memory. More modern miracles of this saint:. In1944 the nazis were picking up Jews from the ionian islands to take them away to death camps. They had been to Corfu and Kefallonia and now came to Zakynthos. The germans asked the mayor of Zakynthos for a list of all the Jews living on the island. The mayor Karrer consulted with Archbishop Chrysostomos about what to do.No doubt they also consulted St Dionysios,as any Zakynthian would under such a circumstance. The Archbishop wrote a letter to Hitler refusing to give up the Jews. When the boat arrived they gave the captain a list with two names on it. Arret and Chrysostomos. They said if the jews are taken,we will go with them and share their fate. The german ship sailed away without a single extra passenger, and the dark evil of the holocaust did not touch the holy ground of Zakynthos,afterwards proclaimed as righteous among the nations by Yad Vashem. Even more recently when the Twin Towers fell,a tiny greek orthodox chapel was crushed under the wreckage. Two artifacts out of this chapel survived: A crucifix and a small paper icon of St Dionysios.